It's Sunday, the third and final day of Wizard World. Unlike Friday and Saturday which had the event going into the evening, today the show would end in the afternoon. Logistically it makes sense since I'm sure much of the post con time would be spent cleaning up the main hall and packing everything away. 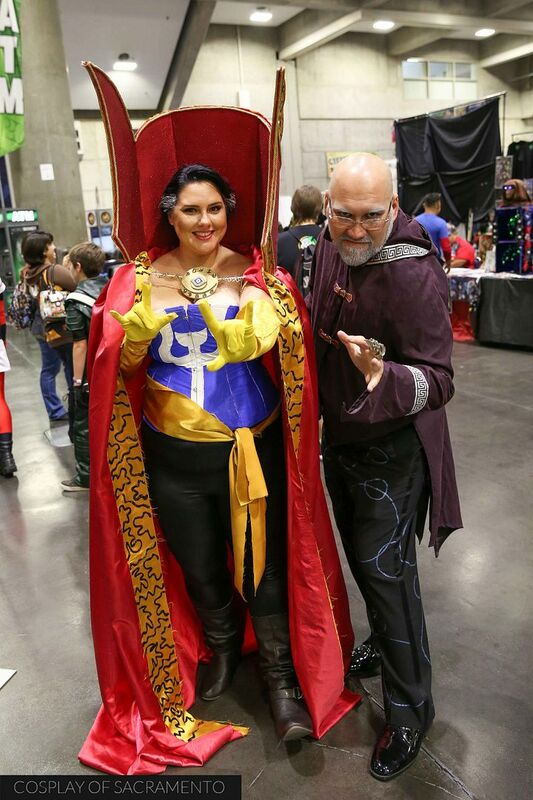 But for us con-goers, it just meant less time to enjoy all that Wizard World had to offer. I definitely felt the time crunch as I made my way through the con trying to soak everything in before closing time. 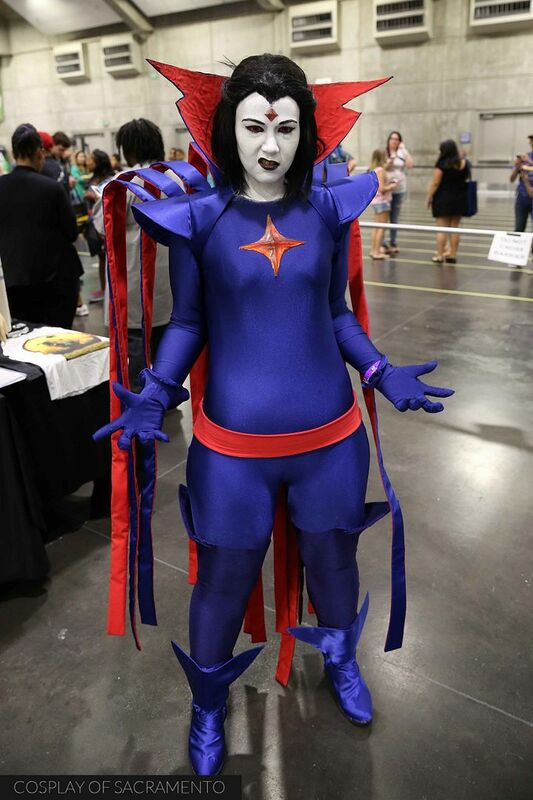 One of the first things I saw when I walked into Wizard World today was this incredible Mr. Sinister cosplay. It is so well done! Or should I say Ms. Sinister? Either way this cosplay is amazing. I'm not sure if it was just me, but I felt that today there were more kids and families on the floor. One of the most unique family cosplays that I saw today was this Lord of the Rings group. 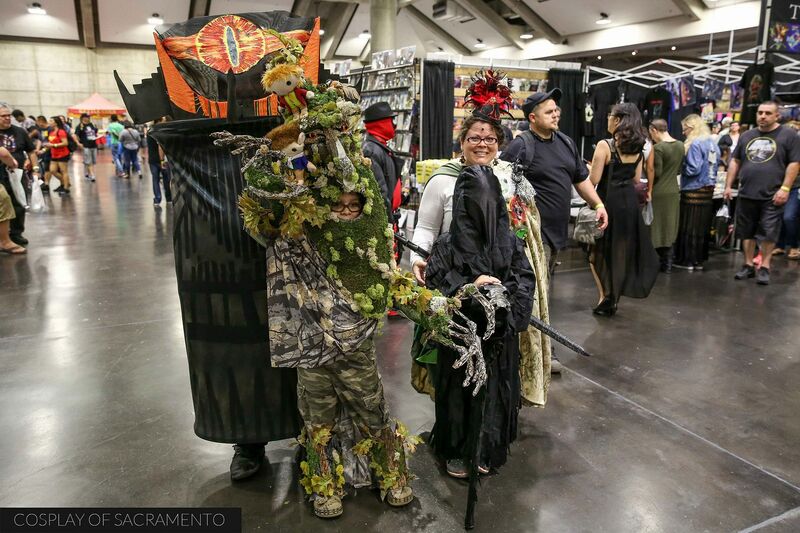 It's an awesome cosplay and I'm sure this family had a great time putting it together. I'm sure as the kids grow up they'll continue on cosplaying and going to conventions like Wizard World. Hopefully they'll enjoy making cosplay for years to come. 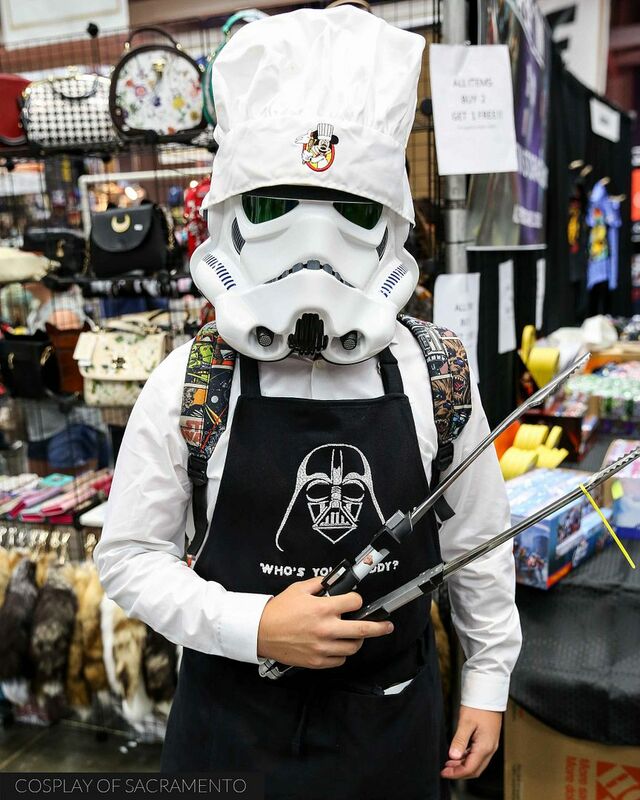 Another unique idea was this Stormtrooper chef cosplay. You just gotta love the tongs he has with him - his hat too! So great! I'm not sure why I find this cosplay so hilarious, but I just do. Actually, adding things like this to Stormtrooper cosplay is really cool because it makes it stand out. I've seen a TON of movie accurate Stormtroopers at cons, but as a photographer it's not that exciting to photograph because if you've taken a photo of one, you've really taken a photo of them all. Having unique details and accessories draws me to this type of cosplay. Keep that in mind for other types of cosplay along those lines as well! These guys were back at it again! 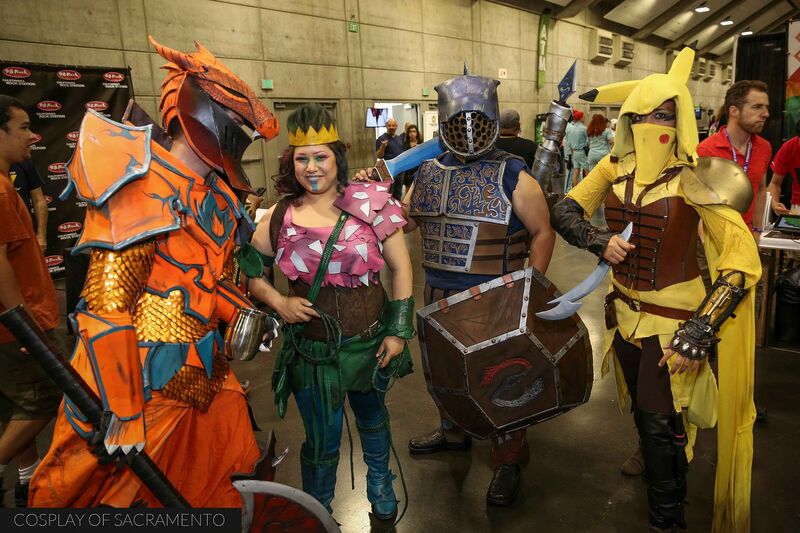 These giants appear at many of the Sacramento area cons and delight con-goers with their sheer size. Though I've seen them numerous times, their cosplay always impresses me. I especially like seeing the reactions of people who see them for the first time. They are always so stunned and amazed. These guys may look intimidating, but don't ever be afraid to ask them to pose with you for a photo - they are always happy and willing to do so. Oh! Another genderbend! This time its of Dr. Strange. As we've seen, the bigger cosplays often do stand out in a crowd, and this Dr. Strange cosplay certainly stands out. I really love the colors here in her costume... and she even did the white hair on the sides of her head! That's pretty awesome. This last day of the con has definitely surprised me with all the unique and thoughtful cosplays being displayed. As if there wasn't already a ton of fun things to see at Wizard World, this cosplaying dog was the last thing I saw before heading back home. So cute! This little guy was so good about staying on his little cloud pillow. Adorbs! If you'd like to see my day three gallery of Wizard World, please click HERE. Saturday is always the best day of the con. It's the longest day and also the day with the most attendance. Yesterday had a small, but energetic crowd... but today the convention center was full of people ready to have fun at Wizard World. Today I had the chance to not only take photos on the main floor, but also shoot a panel as well as do a number of private, individual photoshoots. I was geared up and ready to experience all that this day had to offer! Going to panels at the con is always an enriching experience. It's at these special engagements that you really get the inside scoop on actors, cosplay tips, and upcoming announcements. Wizard World always provides a huge number of panels for con-goers to choose from. This year I didn't get a chance to see any of the big name Hollywood stars as I was swamped with other photo opportunities, but I did catch the Rise of Marvel Comics panel towards the end of the day. The Rise of Marvel Comics is an independent film detailing how Marvel Comics got to the way it is now. The producers are currently crowd funding the movie at the moment. It was great to hear what they had to say. I didn't hear about too many huge meet-ups at Wizard World, but the one I did attend was the Marvel Comics meet up. This meet-up took place behind the Convention Center on the steps just left of the main loading docks. Though the X-Men were well represented by cosplay on the con floor, this meet-up consisted mainly of Captain America and Avenger cosplay with some Spider-Man sprinkled in as well. Big groups are always fun as it's always a party-like atmosphere with so many cosplayers sharing in their own fandoms. The only challenge is for the photographers trying to get everyone in the shot. Wide angle lens time! Today I had the opportunity to do a few private photoshoots. These are always great because it lets me leave the show floor and get shots that are more unique. I mean, hall shots are fine and all, but these types of shoots are just so much more fun! My first private shoot was with Toria Cosplay. I've been wanting to shoot with Toria since I saw her last year. She is an absolutely stunning cosplayer. 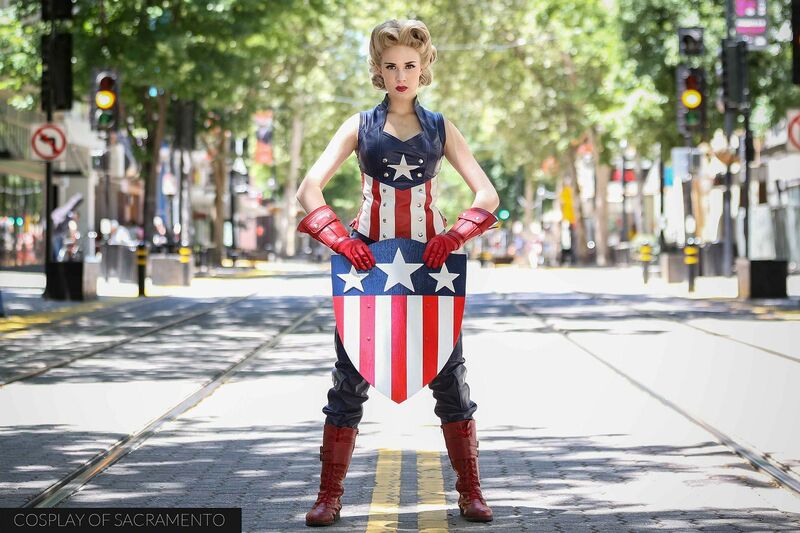 This retro Captain America cosplay she has is a head turner. She can't get two steps in at a con without being absolutely swamped with people wanting to get pictures of her. Thankfully we got to sneak outside and get a few snaps in. She looked gorgeous. Check out my mini gallery of this shoot with Toria HERE. My next photoshoot was with Skynerd and Supakawaiineko. I've shot with both Skylr and Jess quite a bit and they are the most fun people you can ever do a shoot with. Today they had a genderbend cosplay of Quicksilver and Magneto - very appropriate as Father's Day is tomorrow. Besides just posed shots, the girls wanted to do a few with some action incorporated in them. We did a bunch of shots trying to get hair flips right and other crazy stuff. I think the photos came out great! It really is hard to take a bad picture with either of them as they are just that amazing. Sneak a peek at their gallery on my site HERE. Also on this shoot was Deathstardorian. Check out my Day Two Gallery or my Facebook Page to see a gallery of his photos. Yep!!! Even more private shoots! Next up with another favorite cosplayer of mine - Necikait. Necikait and I have paired up for many shoots. I absolutely LOVE her positivity and enthusiasm for cosplay. Her look is always on point and stunning. 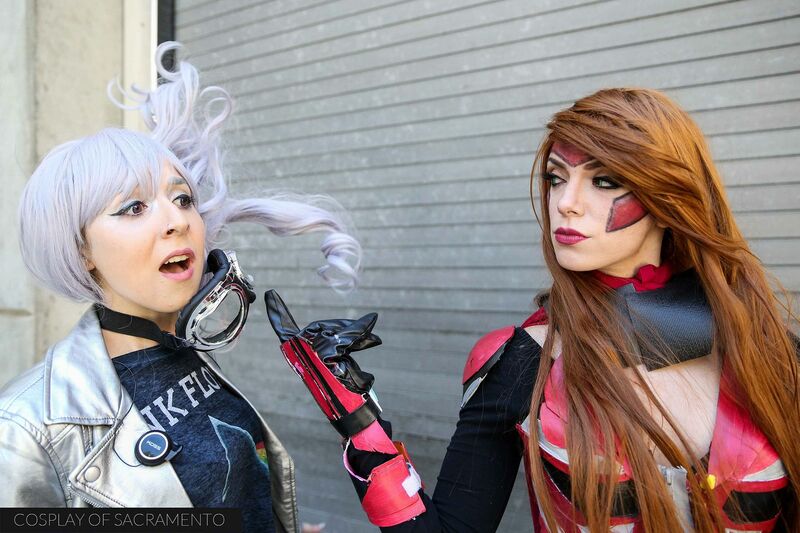 We travelled all around the Sacramento Convention Center to find good backgrounds to take photos. One of my favorites was here in front of some graffiti. 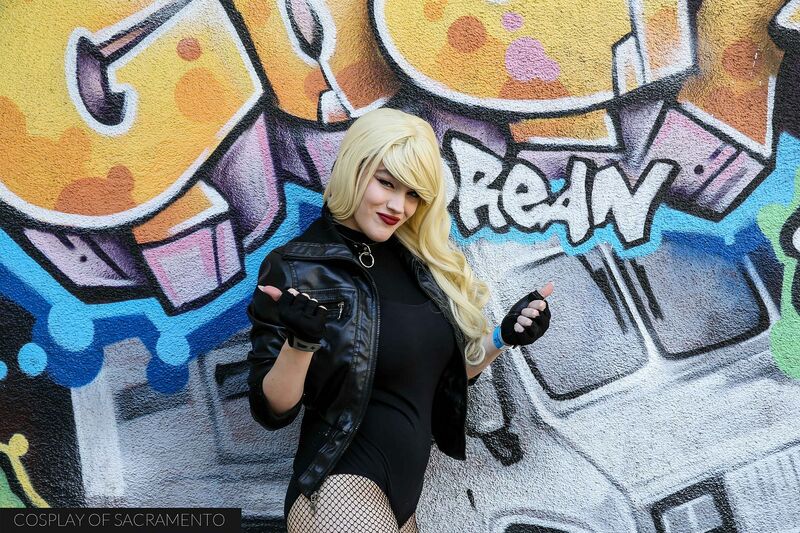 Doesn't her Black Canary cosplay look great with all those colors? I think so! Necikait does a TON of stuff on Snapchat. Look her up there and you'll get a taste of all the stuff she's into! Wanna see the full gallery of our shoot? Click HERE. My final shoot was with Padawantail and Cassierolee. Skye and Cassie are a couple of my good friends and I always love shooting with them. This shot above was difficult as we had to get Skye to use actual spider super powers to stick to the side of this wall. All good though as the photo looks great! I'm still working on this particular shoot so please keep checking back in the group galleries section of my site to take a look at what we did. 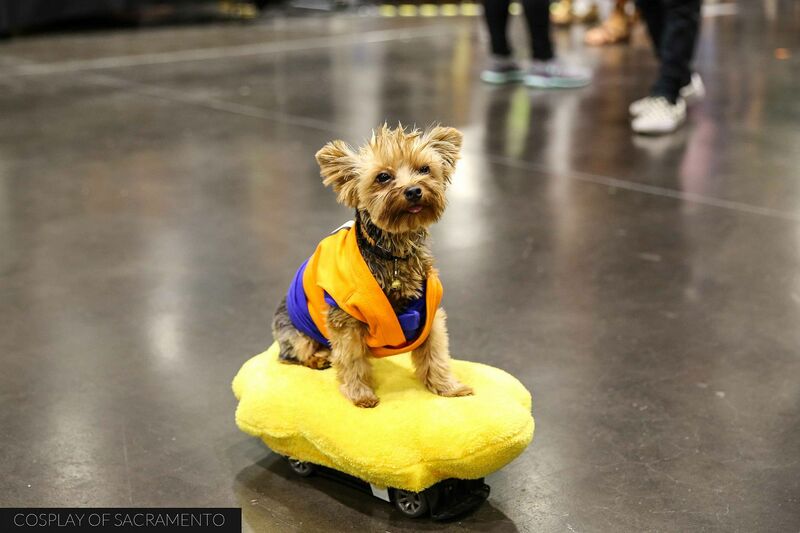 Today was the beginning of Wizard World Sacramento 2016. I remember being incredibly excited for this con last year - and the feelings are pretty much this same this time around as well. 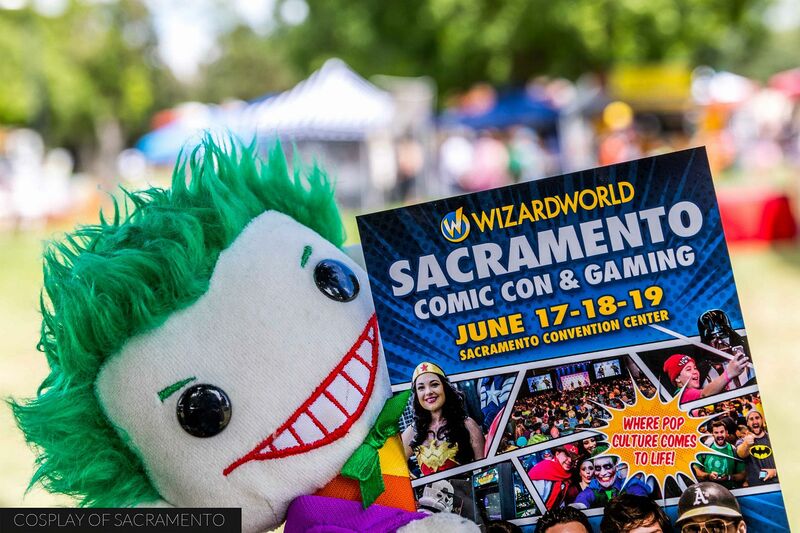 Wizard World is one of the bigger cons to come come through Sacramento, so the excitement and expectation is pretty high. Coming into the main hall, the con looked very organized. Everything had a very nice professional veneer. Wizard World doesn't slouch on offering up some great visual eye candy for con goers to enjoy. 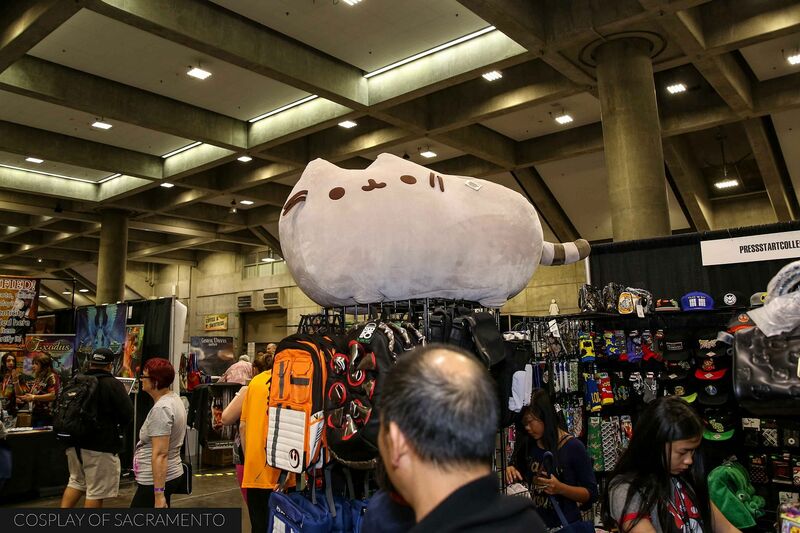 One thing that definitely caught my eye was this giant Pusheen plush that was sitting on top of one vendor's space. I wanted it so bad! It's so cute and would look awesome on my couch! Being a photographer, my main purpose for being here was to check out all the amazing cosplay that would be on display. The first day of the con is usually the slowest, but I really have to give props to the cosplayers that came out today. They looked great! 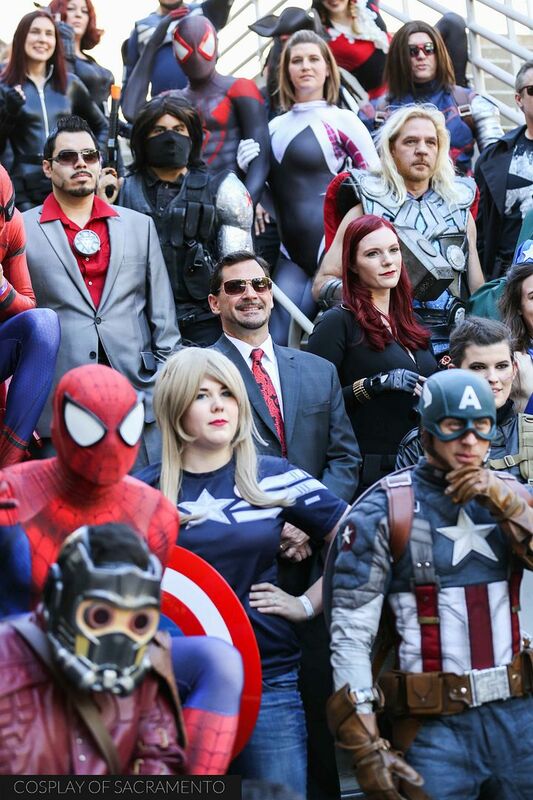 There was plenty of con-goers in cosplay from all sorts of fandoms, but the most prevalent had to be from Marvel as many of the biggest con guests were from Marvel movies. Sebastian Stan, Hayley Atwell, and Evan Peters were all slated to be here in Sacramento. So yes, lots of Bucky, Agent Carter, and Quicksilver could be seen in the main hall! One thing that surprised me about Wizard World was the huge focus on gaming. The entire middle section of the con was the gaming area. The folks over at Wizard World really increased this aspect of the con since last year. 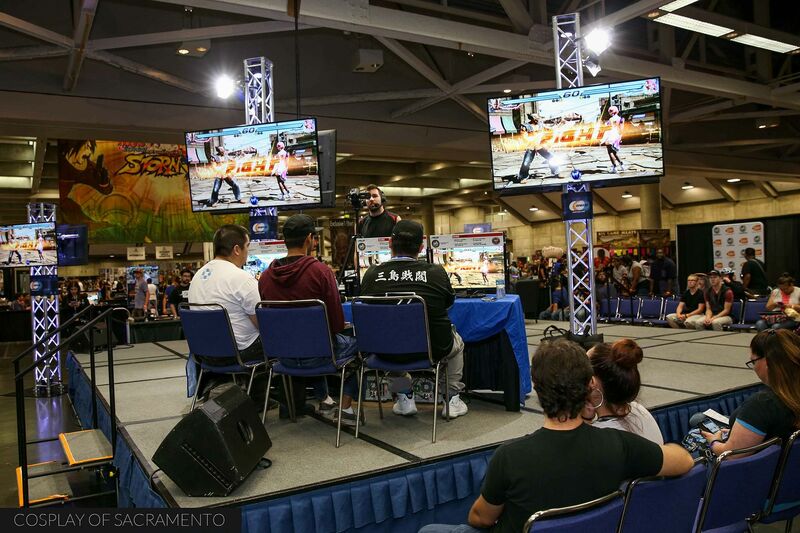 Gamers who came out got to see and play Tekken 7, a game that won't be released in the US until next year. A friend of mine who is big into gaming was kicking himself because he couldn't make it to Wizard World this year to play it. Business-wis, this was a smart decision by Wizard World as it looks like they were able to draw in a lot of gamers because of Tekken and the large focus on video games. A team from the Sacramento Kings came out to shoot some promotional videos for next seasons games. There were two Kings Dancers (Ariana and Mollie) as well as Scott Freshour, the on-court emcee on the floor. 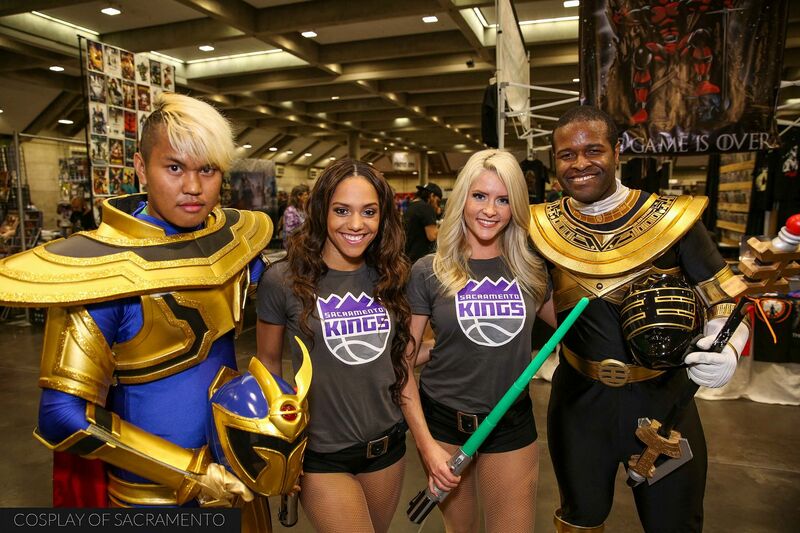 Besides shooting cosplay, I cover the Kings and have done so for the past three seasons. It was awesome to see all of them here at Wizard World promoting the team and having fun with the everyone. The highlight of their visit for me had to have been lightsaber battle that the dancers did with the Power Rangers. It was pretty epic and I can't wait to see the edited video footage of the fight on the big screen next season. One of the biggest thrills I had was meeting this man. He's Whilce Portacio, one of my all-time favorite comic book artists. 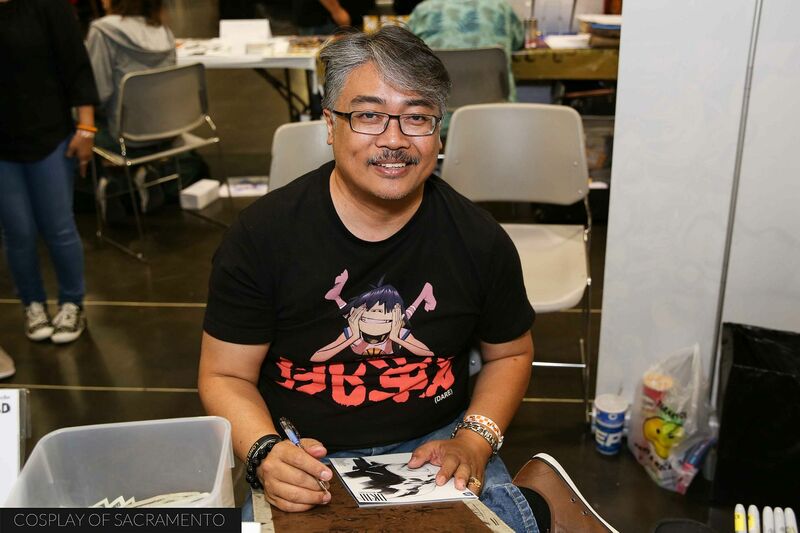 Back in the 90's he drew for Marvel and worked on a number of X-Men related books. My personal favorites were his renditions of the old X-Factor team consisting of Cyclops, Jean Grey, Beast, Archangel, and Ice-Man. He had this unique way of drawing faces with a more angular style. It was really cool and I loved it... still do! Today I got to spend a good amount of time speaking with him and had the opportunity to get a comic book signed by him. It was so amazing! I had such a great time on the first day of Wizard World! I know that this is just the beginning and that day two will be so much more fun than today was. 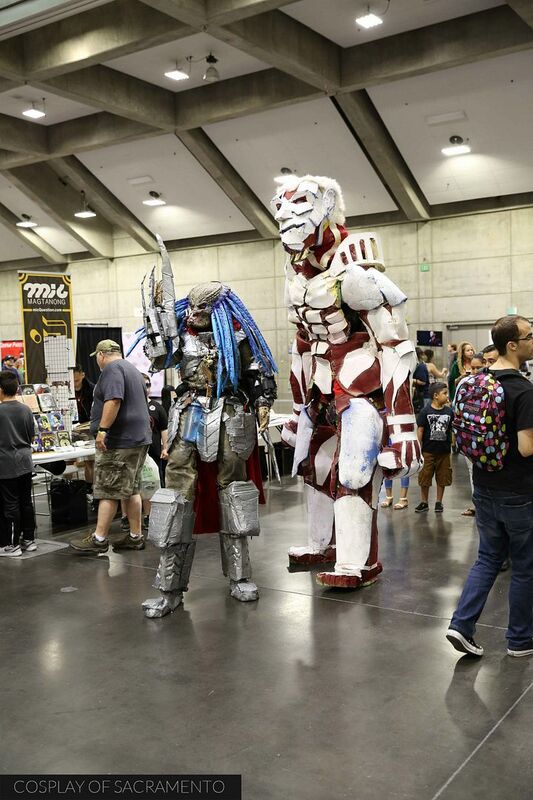 If you'd like to see photos from the con floor, check out my gallery by clicking HERE. Also, watch my video below to see some of the footage I was able to get as I experienced this first day of Wizard World Sacramento! 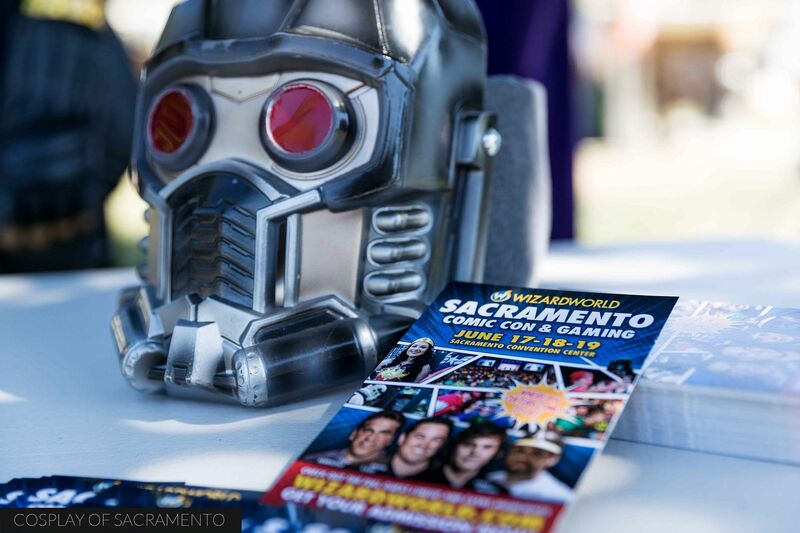 This weekend a small group of us attended the Gold Coast Adventure Faire in Elverta, Ca to promote the upcoming Sacramento Wizard World. Many of us did these same types of promotions last year as well. The main purpose of going out there was to pass out flyers and get the news out that Wizard World is almost upon us. 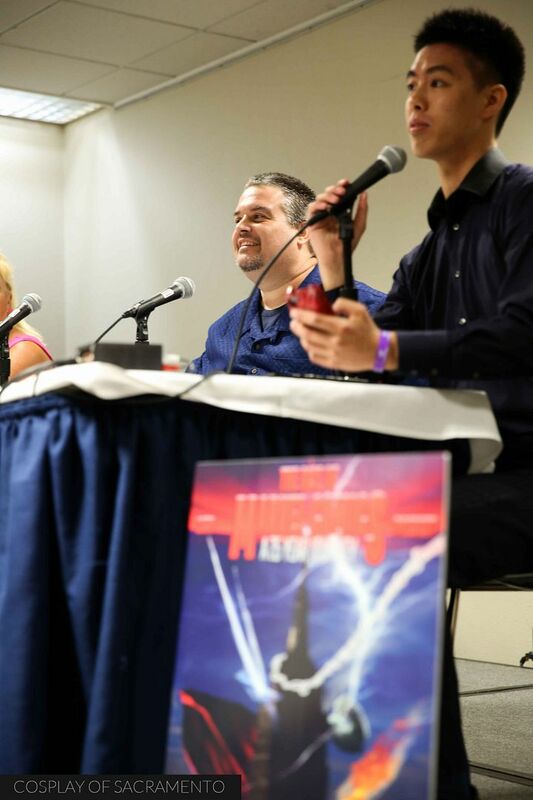 It's always great fun to hang out, meet new people, and let people know about Wizard World. Yes, what we were doing is considered work... but thankfully its something that we enjoy spending time doing. Here's the main crew from Saturday's promotion of Wizard World. 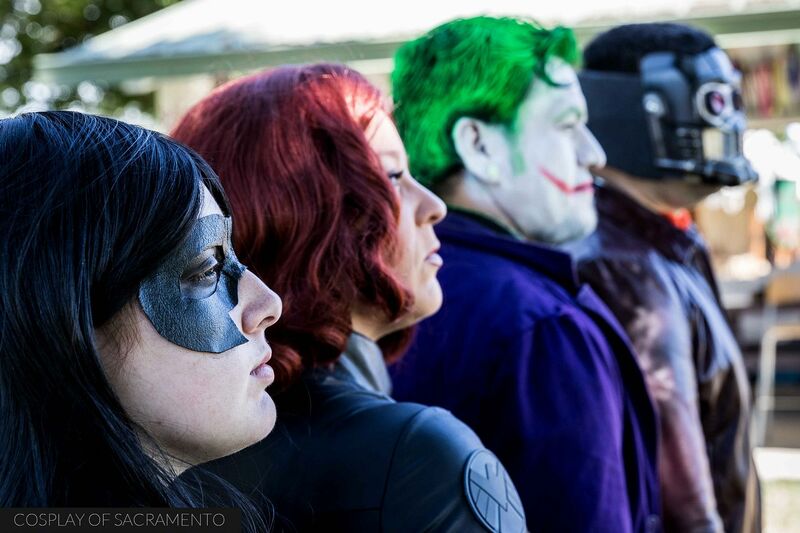 We had cosplayers dressed as Nightwing, Black Widow, Joker, and Star Lord. All of these characters are very popular right now and instantly recognizable by most. It was fun to see the cosplayers interact with the folks that came up to take photos and also to see them get on Good Day Sacramento, a local morning television show. What a great way to instantly get more promotional reach! Steve, a local cosplayer that is the spitting image of Captain Jack Sparrow, also joined in on the promotional fun. He would primarily be part of the Sunday crew, but did spent time with us on Saturday as well. In this photo he is showing us what the Gold Coast Adventure Faire is all about. This event was a renaissance faire featuring all sorts of armored folks, pirates, and even mermaids! Every so often we'd hear a canon go off or people parading around with a prison they had captured. It really was an amazing time with tons to see and experience around us. For those of you interested, Wizard World is happening this coming weekend - June 17 through the 19th. There will be a lot of events going on that weekend as well as the opportunity to meet some really big stars. Huge Hollywood names like William Shatner, Sebastian Stan, Evan Peters, and Hayley Atwell are scheduled to be in attendance. It should be a ton of fun! For more information about the event, check out their main page HERE. 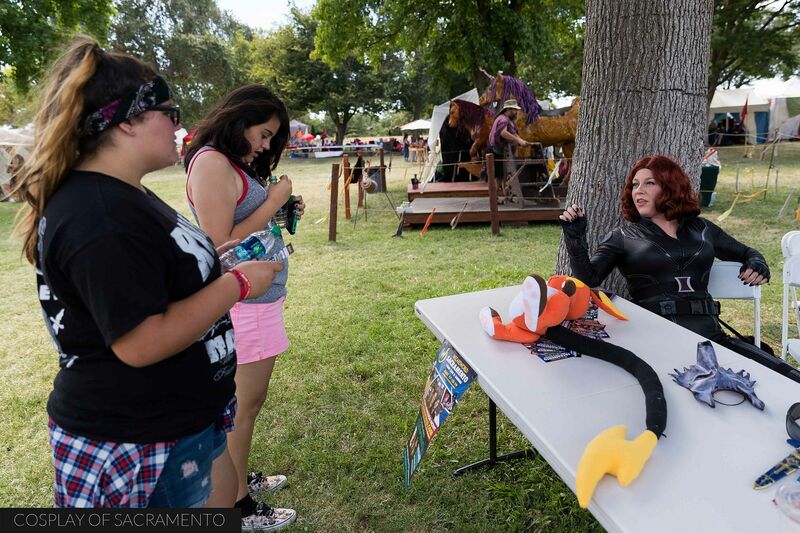 I have to give a HUGE shoutout to Amanda, the beautiful cosplayer who dressed as Black Widow. She took up the burden of organizing and coordinating the promotional events we went to this year. She single handedly went above and beyond to make sure people were gathered in order to make the promotions happen. Without her, there would be no Sacramento Wizard World promotion at all. She definitely deserves all the credit. And speaking of going above and beyond, she also was thoughtful enough to provide the cosplayers who came out cold water and snacks so that they were taken care of. Much love to Amanda! Find her at Icha Icha Cosplay on Facebook and Instagram. Give her a like if you haven't done so already. 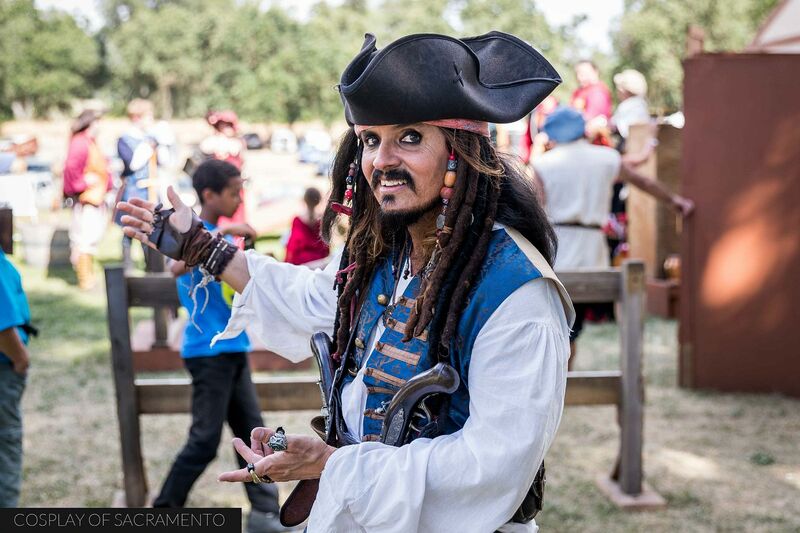 Check out more photos of our time at the Gold Coast Adventure Faire in my gallery. Here's the link! As a photographer, I dip my hat into many different photographic situations. This blog and my main site (www.cosplayofsacramento.com) features cosplay and cosplay related things, but I do a lot of photography outside of cosplay and things related to it. One of those is weddings. I love shooting weddings, and have been the primary photographer for quite a few of them these past few years. Well, today my worlds collided as cosplay and wedding photography came together in spectacular fashion. 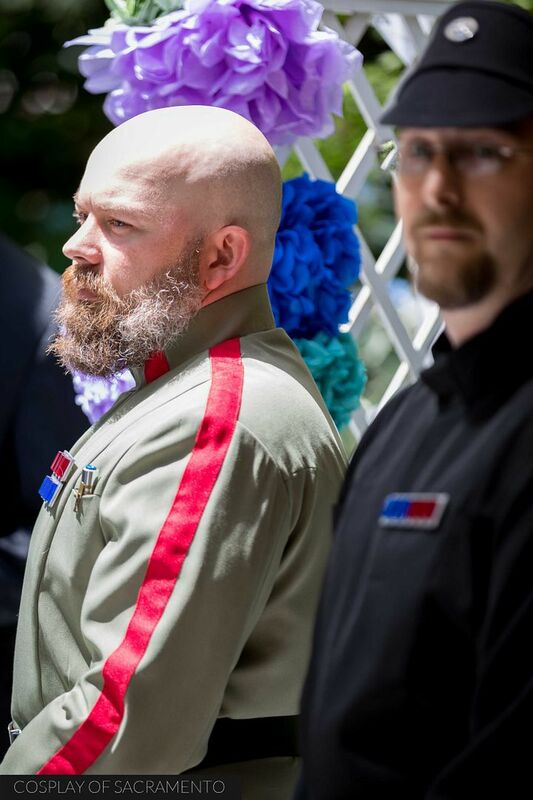 My friends Talya and James got married - Star Wars style. It was definitely an honor to be asked to shoot this wedding. I had met Talya just about a year ago doing Wizard World promotions. Since then we've done various projects and events together. When she asked if I could photograph her wedding I was more than willing to. 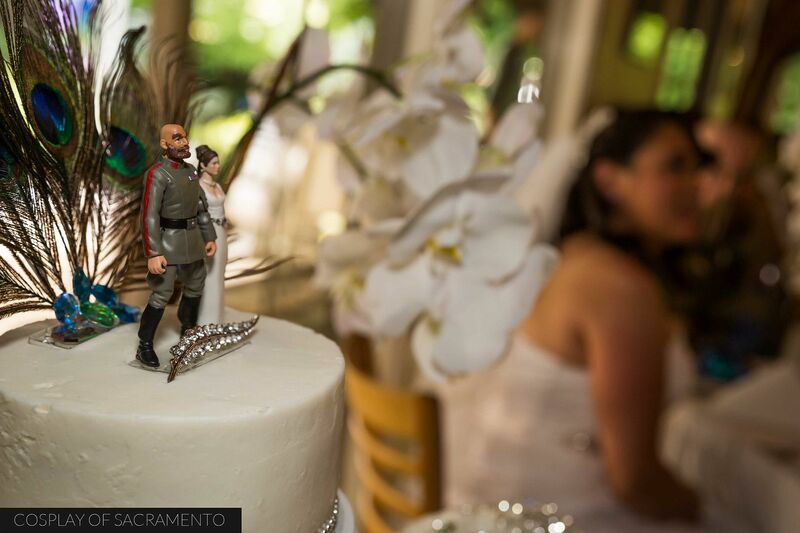 The wedding took place on a gorgeous Sacramento Saturday at a venue called the Casa Garden Restaurant. This location had a beautiful outside space large enough for a small/medium sized wedding. Being that it was Talya and James' wedding, R2 couldn't miss it. 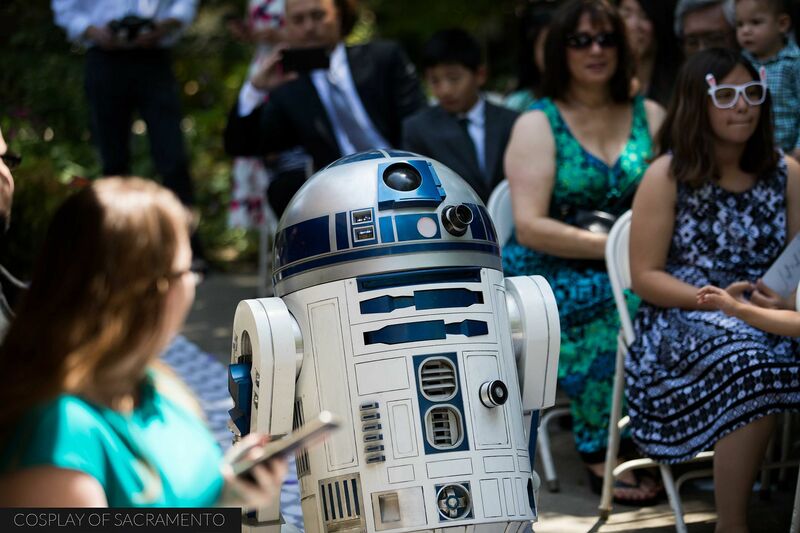 Above is a photo of the droid as he made his way down the aisle. The Mandalorian contingent definitely made its presence felt as well. 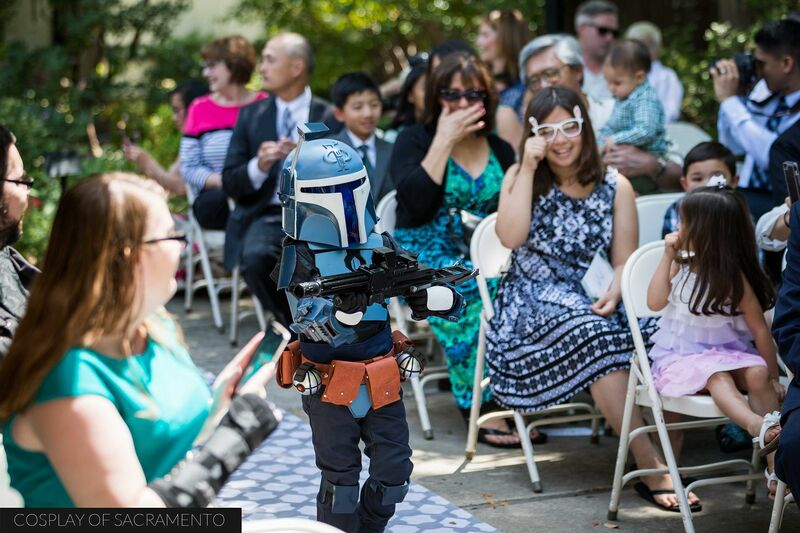 The ladies in this photo seem to be especially smitten with this young Mandalorian - and why wouldn't they? His armor is absolutely perfect.Though not in armor for her wedding, Talya also has some pretty amazing Mandalorian armor herself. It was only natural that the Mandalorians came out in full force today. 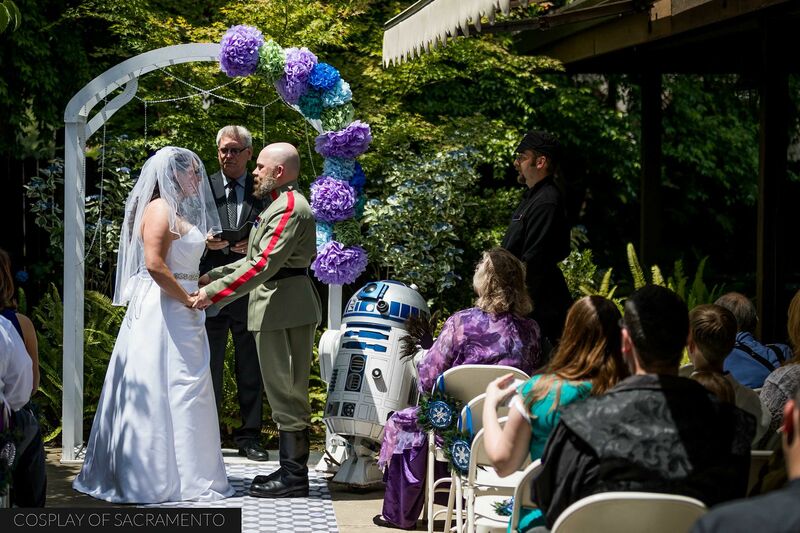 Though the Star Wars decor was quite heavy, the ceremony was rooted in classic Earth culture. Talya and James had many traditional wedding elements. I personally really enjoyed the pairing of the traditional and the fun. It spoke to the sensibilities of both Talya and James. Each element was handled just right. The wedding never felt silly or too stiff. They really pulled it off! Once the ceremony was over it was time for the reception. Huge thanks to Talya and James for providing a delicious meal. I loved hearing the speeches and enjoyed all the fun tidbits that they put into the wedding day. I wish the absolute best for both Talya and James as they begin this new chapter in their lives. I'm sure I'll be seeing them soon at the next con. Check out a few more pics from the wedding HERE.